PlayItOnTheWeb 12,327 free online games and counting. Get as many words as you can. Connect letters to form words, and submit them to score points. how many words can you guess before time runs out? Slide tiles to make words. Find as many english words as possible within the time limit. 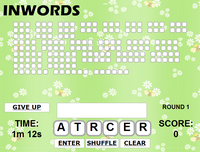 Addictive fast-paced word finding puzzle game. Type or click on letters to spell as many words as possible.